By Nick Vieira, March 28, 2014 at 6:36 pm . 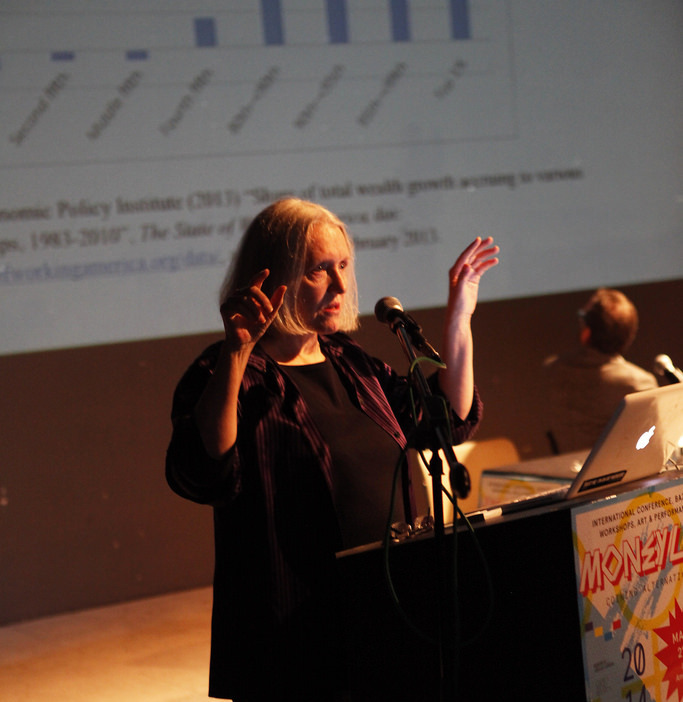 Saskia Sassen joined speakers Stefan and Ralph Heidenreich and Bill Maurer in the first panel of the MoneyLab conference – “Monetization of Everything”. Sassen is a long time friend of Geert Lovink and famous for coining the term “global city”. She opened the session by stating that “it is a mistake to think that finance is about money, that if it only were, it would be so simple”. 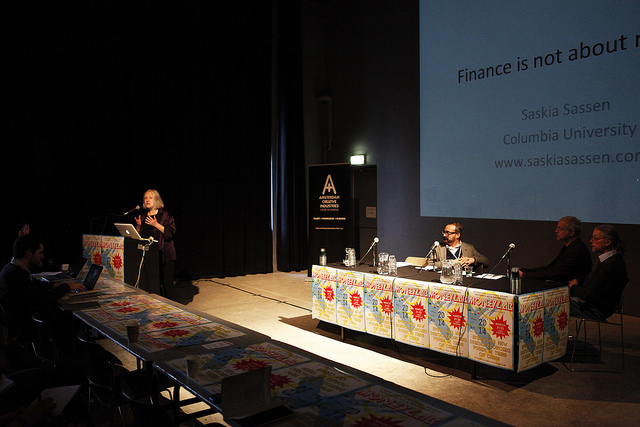 For Sassen, finance has, ironically, enabled the monetization of everything and cannot be simply reduced to money, because then you miss “the key aspect of the plot”. Rather, finance is a capability (understood here as a variable whose valence can change radically). Her interesting talk highlighted that money, material or non-material, has never really existed. This is especially true, she claimed, when you look at some of its current forms such as global GDP and outstanding derivatives. For example, the global GDP, estimates Sassen, is around 60 trillion dollars; however, she carefully notes, this money simply does not exist. What exists is the capability of financial actors and instruments to allow these calculations to act as if they were real. Sassen also distinguished between traditional banking (the selling of money one has or money one can instantly borrow), and finance (the selling of something one does not have). The current system of financial institutions, she argued, revolves around creativity that sells what it does not have through inventive instruments. Furthermore, this financialization then invades other sectors, the ones that actually produce goods and services, since finance itself simply “does not have what it needs to produce”. These institutions hold a monopoly over money creation; nevertheless, Sassen claims that “finance has lost the capacity to govern itself” and keeps fluctuating between different crises whilst continuing to develop instruments of its own accord. In contrast, if we could govern finance, we would be able to build housing for the world, or green energy transport systems for everything. Amongst other issues, Sassen also touched upon financial innovations such as credit, which she better phrased as debt or the “little bridge that helps finance invade just about any sector”, and linked it to the infamous vulture funds that “extract value from little pickings”. Citing the Panama example, she highlighted how these funds managed to aggressively reposition the state by buying their debt, and forcing them to pay it back it with interest.